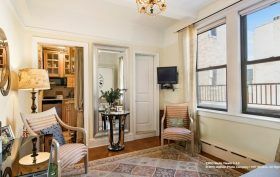 Location is the draw when it comes to this studio apartment at the Franconia co-op, located right off Central Park West at 20 West 72nd Street. It’s a very cozy space that will require a Murphy bed setup. As for a dining table…forget it. But who needs a big apartment when you’ve got Central Park and the Upper West Side right outside your door? The current apartment owner looks to be Johanna Rosaly, a Puerto Rican actress, singer, and television host. She bought it in 2011 for $270,000 and has listed it at a significant bump, for $425,000.